Studying scapular movement, kinesiology and exercises. The closer we look at movement or the potential movement of the human body, the more dynamic, intricate and specific it becomes. When studying the appendicular skeleton, personal trainers will benefit from understanding ideal range of motion (ROM), joint articulation and the influence of the axial skeleton on limb action. The scapula’s position in natural stance often reflects an individual’s daily lifestyle and stress level. For example, many people stand naturally with the shoulder girdle in an abducted position; this is so common it often is overlooked. However, constant contraction of the pectoralis major and minor muscles can cause this chronic pattern to over lengthen the mid-back musculature. Other people stand naturally with the shoulder girdle in an adducted position, wherein the shoulder girdle has moved significantly backwards from the plumb line, causing the person to slouch. It may seem that “standing up straight” with more erect posture would help correct this, but if muscle movers are constantly contracted and used for stabilizing an upright posture, they lose their movement efficiency. Why does this happen? Primary muscle movers help control movement. When tension relationships and joint congruity are optimal, the mechanical sequence of muscle firing works efficiently. Some muscles stabilize joints as others contract and shorten to provide movement. If a muscle is chronically contracted or hypertonic it becomes a poor mover. Understanding ideal ROM and the muscles affecting this range will be useful as you customize exercise programs. The arms have great ROM and freedom of action, as well as stability to give their movements precision and force. The integrity of this stabilization rests upon the powerful musculature which secures the shoulder girdle against the thorax. The tone, attitudes, postures and structures of these muscles vary significantly among people, thus making it difficult to explain “normal relationships” of the scapula to the thorax without conceding a rather wide range of physiological fluctuations. Mobility and free range of the arm is achieved by three individual joints, all mutually interdependent. The primary joint of the shoulder is the glenohumeral joint located between the head of the humerus and glenoid fossa of the scapula. The capsule of the glenohumeral joint attaches to the scapula, on the outer rim of the glenoid fossa. Superiorly, it goes up to the coracoid process and encircles the long head of the biceps at its origin. On the humerus, it attaches to the anatomical neck. The capsule is most weak inferiorly where it has no ligament or rotator cuff muscle support. The scapula, clavicle and shoulder joint form a mechanical unit between the medial clavicle and manubrium of the sternum called the sternoclavicular joint. The clavicle rotates around the sternum and articulates laterally with the acromion process of the scapula, medially with the sternum. The scapula rotates around the clavicle and the humerus around the scapula. The acromioclavicular joint is involved in shoulder movements between the distal clavicle and acromion process of the scapula. Although it lacks some traditional characteristics of a joint, the scapulothroacic joint assists in motion of the shoulder at the glenohumeral joint. Scapular motion is controlled by the scapulothoracic muscles, which hold the scapula in close contact with the trunk and restricts its movements to the contours of the thoracic wall. This article mainly covers the sternoclavicular and acromioclavicular joints and the movements and movers of the scapula and clavicle. It describes their attachments and how the muscles provide the support and motion necessary for optimal range of the glenohumeral joint (a future article will cover arm motion and the musculature that stabilizes and moves this joint). In order to comprehend arm movement, scapular and shoulder girdle movement must be understood first. The position of the scapula in natural stance varies among people. In ideal alignment, the scapula lies directly over the posterior ribcage with the upper back in good alignment. It does not articulate with the ribs, rather it floats over them (approximately ribs 2 to 7). This suspension is created by a network of muscles and ligaments that provide scapular glide. While the scapula is very mobile, it has limited ROM. The scapula is a triangular bone with three angles: superior, inferior and lateral. The three borders of the scapula—superior, medial (vertebral) and lateral (axillary)—create its sides. The lateral border contains the glenoid fossa, where the head of the humerus articulates. This is a very shallow oval-shaped depression, making it very susceptible to injury. The coracoid process arises from the superior border, medial to the glenoid fossa. The anterior surface of the scapula is separated from the posterior ribcage by a thin, smooth layer of muscle that lets it glide over the ribs. The spine of the scapula, easily palpated and seen externally, is a strong ridge running diagonally near the superior border. The posterior surface of the scapula is a major attachment site for many muscles that create scapular movement. Scapular support and motion are provided by muscles that attach it to the thorax and vertebral column. These muscles are oriented obliquely and produce rotatory and linear motions of the bone in their direction of pull. The movements ascribed to the scapula do not occur individually. Some degree of rotation or tilt accompanies abduction and adduction and, to a lesser extent, elevation and depression due to the contour of the rounded thorax. While there are no pure linear movements of the scapula, six basic movements are described in the next section. 1. Anterior Tilt. Movement about a coronal axis in which the coracoid process moves in an anterior and caudal direction (can be considered depressed anteriorly) while the inferior angle moves in a posterior and cranial direction. This movement is associated with elevation. 2. Elevation (Superior Glide). The scapula moves up and away from the ribcage, e.g., shrugging. 3. Depression (Inferior Glide). The scapula moves downward and against the ribcage. 4. Abduction (Lateral Glide). The medial border of the scapula moves away from the vertebral column and the lateral angle moves anteriorly. Following the contour of the thorax, it assumes a posterolateral position in full abduction (also called protraction). 5. Adduction (Medial Glide). The medial border of the scapula moves closer to the vertebral column and the lateral angle moves posteriorly (this relates to retraction). 6. Rotation (Inferior Angle Moves Toward or Away From Midline). Rotation of the humerus is associated with similar rotation of the spine. The movement is around a sagittal axis and is related to the glenoid fossa’s movement. Medial or Downward Rotation (Glenoid Fossa Moves Downward): Inferior angle (bottom of the blade) moves superomedially (up and toward the spine) as the lateral angle (nearest the humerus) moves inferolaterally (down and away from the midline). Lateral (Upward) Rotation: Conversely, inferior angle (bottom of the blade) moves superolaterally while the superior angle moves inferomedially again, using the glenoid fossa as the reference point. The scapula and clavicle are moved by numerous muscles, many of which also provide movement of bones such as the humerus, spine and occiput. Depending on whether the scapula is fixed determines the action of these muscles. There are also many muscles that stabilize the scapula and clavicle during arm and head movement. Serratus anterior is a broad, thin muscle covering the lateral ribcage. It originates from the upper eight ribs and inserts along the medial border of the entire scapula. It functions in abduction and rotation and helps hold the scapula in place. Serratus works to upwardly rotate and depress (lower fibers) the shoulder blade. When the scapula is fixed, (in actions such as push-ups, it is important to keep the scapula fixed in place against the ribcage) the serratus fibers contract when the arm is pushing against resistance. In such a situation, the middle fibers of trapezius (an adductor) and serratus (acting as an abductor) contract simultaneously to stabilize the scapula. The inferior fibers of serratus assist in inspiration by helping elevate the ribs. Subclavius originates from the first rib and its cartilage to the underside of the clavicle. It depresses the clavicle. Pectoralis minor originates from ribs 3 to 5 and inserts on the coracoid process. When the ribs are fixed, it pulls the scapula downward and forward, and acts to stabilize the scapula. When the scapula is fixed, pectoralis minor assists in inspiration by elevating the ribs. Sternocleidomastoid (SCM) acts primarily on the head and cervical spine. If the head is fixed, SCM can assist in inspiration by elevating the region where the clavicle and sternum meet (sternoclavicular joint). Levator scapula originates from the transverse processes of C1 to C4. Levator scapula inserts on the superior angle of the scapula, elevates it and rotates it downward. When the scapula is fixed, it acts on the cervical spine with splenius capitis to extend the head and cervical spine. Rhomboid major originates from T3 to T5 and inserts on the lower two-thirds of the vertebral border of the scapula. 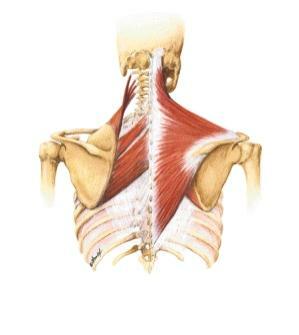 Rhomboid minor originates from C7 to T1 and inserts on the upper third of the superior angle of the scapula. These muscles adduct the scapula and assist levator scapula with downward rotation. When the scapula is fixed, their contraction pulls the thoracic spine laterally. Trapezius originates on the occiput, nuchal ligament and spinous processes of C7 and T1 to T12. This large diamond-shaped muscle inserts on the lateral third of the clavicle (upper fibers), acromion and scapular spine (middle fibers), and a tubercle at the medial end of the scapular spine (lower fibers). The orientation of these fibers ranges from inferolateral to superolateral. When all of the fibers contract simultaneously, they adduct the scapula. The upper fibers acting alone elevate and upwardly rotate the scapula and elevate the clavicle. The lower fibers acting alone depress and upwardly rotate the scapula. The upper fibers are very often over recruited in normal daily movements such as typing or sitting at a computer. These types of movements require prolonged periods of suspension of the arms causing “stiff neck” or a sensation of spasm or headaches. When force needs to be exerted or absorbed by the arms, the mid fibers of trapezius (adductor) act synergistically with serratus anterior (abductor) to stabilize the scapula. Although the following exercises can strengthen the scapular muscles, their true intention is to integrate concepts of scapulohumeral rhythm. Use them first as awareness-building movements to increase the client’s understanding of stability and motion, and then as strength-building movements. The timing of these muscles during arm movements is essential for both integrity of the joint capsule and range of motion (ROM). For instance, you may observe a client consistently shrugging the shoulders while initiating arm movements; these exercises will help that client understand scapular glide and rotation to perform more accurate movements to increase ROM. These exercises are adaptable not only in equipment used but also in body position. The basic movement progression is to begin in a supine position, progress to a seated position with legs either straight or folded “Indian style” (a more challenging position for most clients’ lumbar support) and progress again to a standing position. Adding gravity is an obvious progression. Lie supine with 55-centimeter stability ball centered between hands and arms at shoulder level (perpendicular to floor when supine). With shoulders neutral, inhale and lengthen spine through top of head. Cervical spine should flex slightly to increase movement potential of scapula. While exhaling, adduct shoulders to floor, pressing hands firmly into ball. Do not shrug up to draw shoulders together as arms move toward floor. Shoulders should stay away from ears to maintain maximum length of neck. While exhaling, return to starting position. Perform 5 reps and then proceed to #2. Same setup as in #1. While exhaling, abduct shoulders from floor, reaching toward ceiling with ball. Do not shrug to abduct. While exhaling, return to starting position not by adducting shoulders but by simply relaxing. Be sure to return to neutral position before repeating exercise. Perform 5 reps and then relax. If the client can execute these first two exercises easily, challenge him by having him try them while seated Indian-style. Both can be performed with the arms either extended horizontal to the ground or reaching slightly upward at a 45-degree angle. For more advanced strength exercises, use a resistance band or cables. The elbows should remain straight, and the movements of the shoulder blades should be emphasized. Standing positions can also be applied to these functional movements. Using the same idea and movements, you can also employ a closed-chain push- up position. This can be done against a wall or, for greater body weight resistance, against the floor. In this variation, the client does not move the arms; the torso moves without the elbows bending. Maintain strong plank position (don’t allow pelvis to sag or spine to sway), as abdominal support is a key stabilizer in this movement. Allow the scapulae to retract and depress toward the spine while keeping the ribs and torso horizontal to the ground. Think of “wrapping the scapulae around the ribs.” Hold the position for one breath cycle and release by sending the scapulae back to a neutral position. Do 5 to 10 slow and precise repetitions. Begin older clients with the least resistance and slowly increase the difficulty with more challenging positions. Trainer places his hands supine on client’s shoulders. Client is cued to shrug shoulders up to ears against resistance of trainer’s hands. Do not allow client to internally rotate or protract the shoulders or arms. Client holds position for one full breath cycle and then releases. Trainer can press on client’s shoulders to stretch mildly as he returns to neutral position. Do 5 to 10 repetitions. The client can perform this exercise in a standing position by elevating the shoulders to the ears and then depressing or lowering the shoulders without internally rotating the arms. Collarbone should stay wide as the shoulder blades lower down the back. A resistance band can be an interesting addition. The client places the band in one hand and stands on the other end to anchor it. Performing the same motion as in the first progression, the client experiences force resistance in just one arm. This forces the brain to differentiate between resisted and unresisted movement. Holding a different size weight in each hand during the exercise also challenges neurological integrity. Sit between two yoga blocks with legs extended and a hand on top of each block. Depress shoulders to push down on blocks to lift buttocks off floor. Hold position for one full breath cycle and then slowly lower body to floor. Do 5 to 10 reps (depending on difficulty). The client can perform this movement while seated Indian-style, with his legs extended or with his back against a wall. It can be as simple as adding an overhead reach to exercise #4. However, reaching overhead also challenges the thoracic spine stabilizers and requires adequate length of the pectoralis and latissimus musculature. Again, an understanding of stabilizing mechanisms is essential to command a movement of this nature effectively. This also can be performed with a resistance band or a 45 to 55-centimeter physioball between the hands. With arms straight and in front of the body, inhale and reach upward into flexion until the arms are overhead. Cue client to maintain stable rib and spinal alignment as arms move up. Once maximum ROM is achieved, hold overhead arm position for a full breath cycle while sending the scapulae into depression. Lower arms to beginning position. Do 5 to 10 reps. This can be done with resistance bands, a lat-pull down machine or cables. With arms reaching into flexion in front of the body and perpendicular to torso, inhale, lengthening through cervical spine. While exhaling against resistance from above (high cable), press and lower arms to sides and into extension so the arms are directly at the sides of the body. As the arms draw downward, externally rotate arms slightly to increase awareness of downward rotational aspect. Watch for “rounding shoulders” as the arms move toward extension. Hold position for one full breath cycle, watching for added and unnecessary extension of lumbar or thoracic spine, and then relax. Do 5 to 10 reps.
Do not overload with excessive weight. Train for motion, not just muscular shape! Want more from Sue Hitzmann?